Garagist Salvatore's recommendations for Motoguzzi's third and last release of the first 12" series. Blindfold yourself with a oil soaked cloth and then follow the Hispanic snapper matador. He is the conductor who will guide you over the slippery floor. Give him your eardrum. Move your hips. Feel loved. 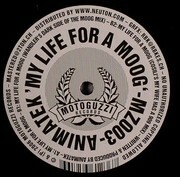 - "My Life For A Moog"